This is in honor of all the leftovers that seem to linger in the fridge uneaten. Here we had a few pan roasted baby potatoes, plus some leftover chicken and ham. 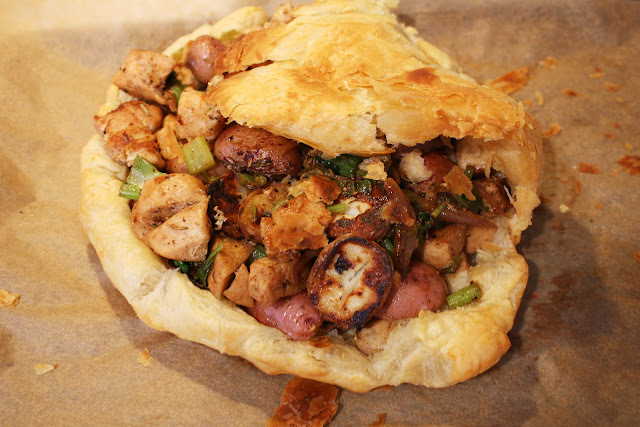 To that I added some copped celery and sauteed them with some red onions and parsley, mixed it all together and wrapped it all in some puff pastry rustically, then baked it following the instructions until it was nice and golden brown. Looks decadent! Ahhh I just cut up a bunch of veggies to start off the week right and now I just want a meat pocket! Hah! Fantastic off the cuff recipe!